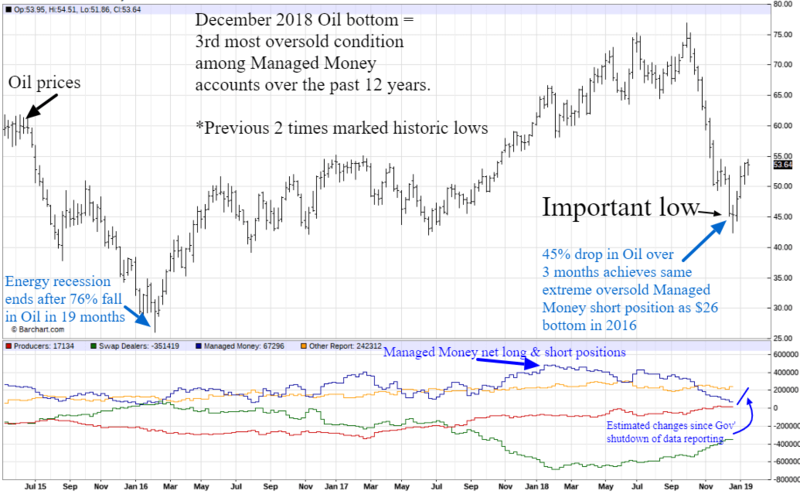 While a renewed intractable Trade War with China and a US recession would ruin our call for an important bottom in Oil prices in the $40’s, we feel the extreme pessimism among Money Managers in December regarding Texas Tea will provide support for Oil. The implication of this perspective is that the US and Global GDP growth will bottom in early 2019 and then edge higher. What is surprising is that hedge funds were as negative at $42 Oil in December as they were at $26 in 2016 or even at the 2008 recession lows near $30/barrel. December should be a low that holds. As with stocks and so many commodities, the caveat to this thesis is an unpredictable implementation of new US tariffs on China in March should trade negotiations cease. It’s sensible to temper enthusiasm of Oil returning to the mid $70’s or higher too quickly with the current global economic downshift capping consumption growth, along with stable to higher supplies when we net out US growth and OPEC forced output reductions. Upper $50’s may cap prices in the first quarter, but even higher prices by summer are expected if China trade normalizes. Our 2016 call for a mid $20’s low and rally until October 2018 before correcting into late 2018 – early 2019 have provided a general map of expectations. The Government shutdown and unreported data along with Holiday vacations delayed analysis of the obvious market low in Oil at year end. For now we expect a mild topping phase to form in late January in the mid to upper $50’s before a partial retracement of the January surge. The extreme oversold Buy signals on Christmas we highlighted for the stock market have rung just as true for Oil. This adds to the Bull case for both in that stocks and oil almost always move in sync. This may confuse some in that lower Oil prices are great for the economy empirically, providing an equivalent tax cut spending boost for consumers. However, Oil rises primarily on positive economic expectations and falls when expecting a slower economy. The correlation of Oil and the Stock market has always been logical. The rare divergence might occur when Oil supplies rise faster than consumption trends in a strong economy. Such might have been the case in 2018 and 2019 had Russia, Saudi Arabia, Iran and Venezuela had free market regimes that allowed stable Governments and capitalist incentives for output. Oil at $42/barrel over Christmas was an important low. A secondary seasonal low should arrive in February or March before prices move higher again. The degree of correction from the January peak remains hostage to events surrounding the US and China trade negotiation and “potential” deadline of March 1st.